Mr. Henry Maksoud built his 460-room hotel, Maksoud Plaza in 1979, based on tradition and service. 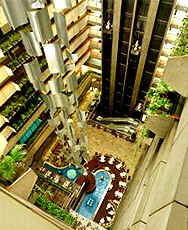 During our stay at the hotel, which is centrally located near the Financial Center and Avenida Paulista in December 2004, Edward F. Nesta and I had the opportunity to sit down and meet with Mr. Maksoud, who believes that a “hotel is tradition and hospitality”, of which Maksoud Plaza exudes both. Although there may be newer and smaller luxury hotels being built in São Paulo every day, few hotels in the luxury segment offer as many services as Maksoud Plaza. Mr. Maksoud, long a proponent of the benefits of technology, has seen to it that the hotel has wireless connectivity (WIFI) throughout, from the lobby areas to the guestrooms, where he has installed fast-track connections, allowing guests to work anywhere in Maksoud Plaza. For guests traveling without a laptop, there is a Business Center, or they can even have a complete computer set-up sent to their room. Technology extends to the guest rooms where via a remote control the guest can operate the lights, climate control and the television. For guests in a hurry to arrive at a meeting, they can rest assured that there is even a heliport on top of the building. There is a state-of-the-art Fitness Center, large indoor swimming pool, wet and dry saunas, as well as hydrotherapy and massage treatments. To ensure that guests will have a quiet and private stay at the hotel, there are thick doors and walls, and multiple draperies to block out exterior sounds, as well as provide a dark room for sleeping. The hotel has a gastronomic center, which allows guests to select their preferences from four different restaurant menus, allowing them to mix-and-match from any of his restaurants. How clever to be able to select an appetizer from one restaurant, a main course from another, and a dessert from yet another. Mr. Maksoud, who takes great pride in his restaurants, and justly so, takes restaurant quality to a new level, by having independent monthly inspections of the restaurant food, cleanliness and service; guests can be assured that the restaurants’ standards are high. Equally important to Mr. Maksoud is visual appeal, and the restaurants feature Riedel glasses and Noritake china, and his Chefs, Leo and Andre, are widely recognized as top chefs in São Paulo. Quality of the food is excellent with ample portions. We had had a wonderful dinner at one of the restaurants, which you can read about in the Restaurant section, as well as in Chefs' Recipes where the chefs share two of their recipes. Contemporary art aficionados will appreciate the enormous 1-ton aluminum sculpture that is hung from the ceiling of the hotel, which is gracefully suspended in mid-air. Rare Brazilian wood and important contemporary works of art and sculpture by Brazilian artists are scattered throughout the hotel. Guests in premium rooms and suites longing to limber their fingers may do so on the grand piano in the VIP Lounge on the 22nd floor of the hotel, where guests can relax, as well as enjoy the exceptional views of São Paulo. In addition to conference rooms and ballrooms, Maksoud Plaza also has its own theatre. The hotel is conveniently located near Avenida Paulista, so guests seeking a cultural experience can easily walk to the nearby museums. During our stay at the hotel, we visited the newly opened Casa das Rosas, Avenida Paulista, 37, an elegant former 1930 residence that opened in December 2004, and offers guests use of their poetry library, which has a collection of over 3,500 books, as well as lunchtime poetry readings and evening classes. 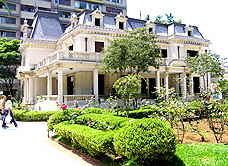 The museum also has beautiful labyrinths and rose gardens, hence their name, Casa das Rosas (House of the Roses), where they invite guests visiting São Paulo the opportunity to “stop and smell the roses.” Maksoud Plaza and the city of São Paulo have something for everyone. Please read our other articles on Brazil in Destinations, Hotels & Resorts, Restaurants, Gastronomy, Chefs’ Recipes, Spas and Music Scene. You may also enjoy our article the “Best of São Paulo” in Destinations. © April 2005. Luxury Experience www.luxuryexperience.com. All rights reserved.